All I want for Christmas is a Canoe! There’s a very cool cedar canoe right off the shores of French Lake. Imagine a canoe like this under your tree tomorrow morning! Now that the days will begin to lengthen, we can all start dreaming about our next epic canoe trip in 2014. If you can’t make up your mind where to paddle, make Quetico your next destination! Northern Ontario is a wonderful paradise of blueberries. Every time I visit, I seek out a patch. Locals have their secret blueberry patches, and will not reveal the location under any circumstance. I have visited the Shield Country enough times that I now have a secret patch too! Wild blueberries are quite small, but really tasty. 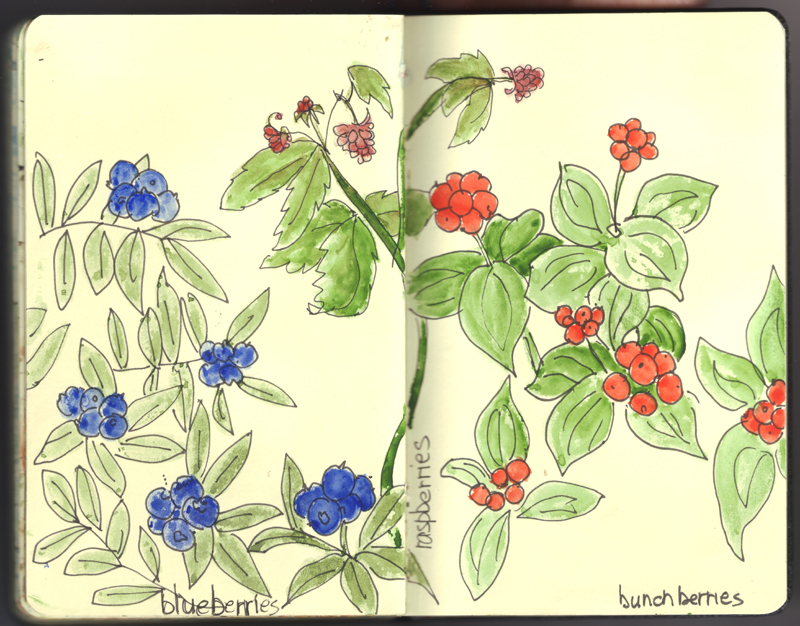 According to my search, bunch berries are also edible, but not as sweet. Rather than snacking on them, I just love how the red berries brighten up the forest floor. There’s an abundance of wildflowers in Quetico. 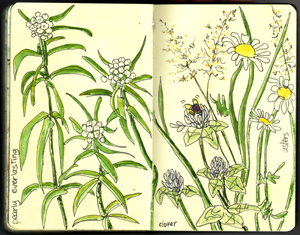 One of the wildflowers I spotted – and sketched – is Pearly Everlasting. Pearly Everlasting gets its name from two sources. Everlasting refers to the fact that the flowers are easily preserved when cut, hung upside down, and left to dry. Pearly is derived from the plant’s species name, margaritacea, which means ‘pearl-like’. Caterpillars use Pearly Everlasting as a host plant, and Butterflies use it as a source of nectar. What a great plant for our Parks! “Why did the fungi leave the party? 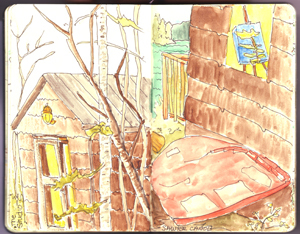 There’s an engaging trail between the Trapper Cabin and the Artist’s Studio. 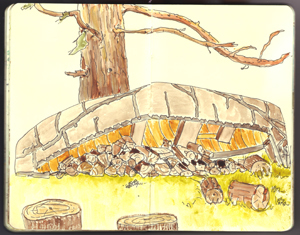 It hugs the shore of French Lake and provides a pretty nice transition between the work of the studio and the comfort of the sleeping bag. 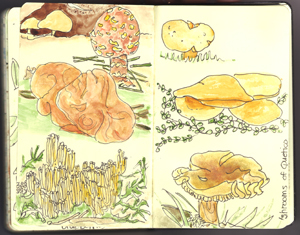 I love the lichen and mushroom “bling” of the forest. Every time I walked the path, something always caught my eye. 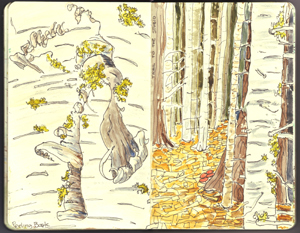 From a distance a forest can appear to be pretty still, but up close it’s teaming with life! 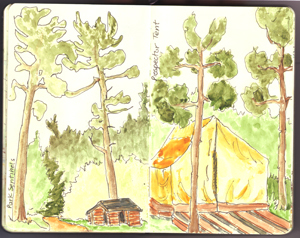 The artist residency at Quetico comes with an opportunity to stay in a Trapper’s Tent just down the trail from the studio. It’s a traditional canvas tent, complete with a cot for those who don’t like to sleep on the ground. This style of tent has been around since the fur trade. More recently it has been embraced by the “glamping” crowd (glamour camping), as it has the roominess and versatility to create a pretty decadent camping experience. There’s a jewel box of a studio along the shores of French Lake. The Quetico Foundation led a highly successful campaign to cover the costs of renovating an old pumphouse so that an artist residency could be established at the Park. It’s a warm and cozy space, and provides a wonderful entry point for inspiration and adventure at Quetico Provincial Park. For details on this residency, go to www.queticofoundation.com. Get ready for the skeets!